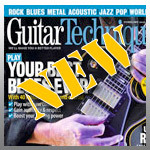 Latest edition of Guitar Techniques magazine is out now in the shops featuring my latest Metal Bootcamp column which is the second part in a four part series that looks at the Sweeping Technique as it applies to 5 and 6-string triad arpeggios. With Yngwie Malmsteen, Jason Becker and Marty Friedman as references, the article presents a routine targeting the development of accuracy, timing and control which is necessary in order to build speed and fluidity using the Sweeping Technique. The lesson features an overview of the main shapes used with Major, Minor and Diminished arpeggios, practice exercises, licks and melodic pieces based on the Neo-Classical Rock/Metal style that emerged in the mid 1980’s and is based on an upper-intermediate technical ability as a starting point. If you’ve not heard much of this technique check out Rising Force (1984) by Yngwie Malmsteen, or the later album Alchemy (1999) is a showcase of Sweeping. Also must-haves in the collection from the golden age (1978-1988!) would include Speed Metal Symphony (1987) by Marty Friedman and Jason Becker and Perpetual Burn (1988) by Jason Becker. Rock! This entry was posted on Wednesday, January 20th, 2010 at 1:09 pm	and is filed under News.